The competition for recruiting top talent is already intense in certain industries and is soon to grow in many others. In this highly competitive environment, you can not expect to fill your quota, no less recruit the highest quality candidates who you desire, without having a superior recruiting toolkit. If you are currently dissatisfied with your recruiting results, you should adopt a more pro-active approach and begin to push the limits beyond the use of traditional recruiting tools. If you are a bold recruiter and you want to try something aggressive,I have compiled a long list of bold high-impact recruiting tools for you to consider. Each one has proven to produce results. The toolkit is broken into five categories, including sourcing, referrals, recruiting at events, college, and advanced recruiting tools. Boomerangs /rehiring previous employees. The best way to ensure a high-quality hire with a clear record of performance is to re-recruit performers who previously worked at your firm (i.e. boomerang rehires). Many of these individuals might now regret their decision to leave but still be hesitant to reapply. A simple note as they are leaving your firm or a phone call from a recruiter or an employee in their former department reassuring them that they would be welcomed back might be all it will take to re-land proven talent. Ask references for referrals. You should ask the job references of top candidates and new hires to provide you with one or two additional names of top people they know. Ask for names during the hiring and the on boarding processes. Directly challenge the industry knowledge of your best candidates by asking them (as part of the interview) to list the names of the outstanding individuals who they know. If you ask enough interviewees, you will get a pretty good list of the top names in any field. In addition, make it a standard practice to ask all top new hires during on-boarding who else is good at their former firm and in the industry. 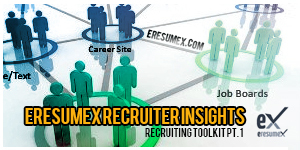 Next ask the new hire to help you recruit any desirable individuals who they know. Revisit previous high-quality candidates. Oftentimes you can save resources by simply revisiting the star candidates who got away. Reach out to candidates who voluntarily dropped out of the hiring process, turned down an offer, or who were finalists in a slate where a super candidate ended up getting the job. Times change, and it’s not uncommon for candidates to regret their decisions. Also look at candidates from a year ago who were almost qualified, because after another year of experience, they may now be fully qualified. Make your job postings exciting. Many recruiters use dull job descriptions that were written long ago. Hiring managers and recruiters should work together to rewrite them so that they sell the exciting aspects of the job. At the very least, they should be tested against your competitors’ descriptions to ensure they are more compelling. Target ex-military personnel. Both the U.S. and Canadian armed forces release a large number of well-trained and disciplined military personnel each year. The unemployment rate among them is high; use military help groups and military recruiting events to identify and sell the very best. Retirees. Some retirees have second thoughts about leaving the world of work, while others are willing to work as fill-ins. So keep in touch with those retirees who you might like to have return. Temp conversions. Develop a formal process to ask the very best temps, contract workers, and vendor employees if they would consider becoming a regular member of your staff. How-would-I-find-you-again profile? In order to identify the best recruiting sources, turn to your own top employees and ask them if I was recruiting you today, how would I go about finding you again? This means that you have to put together a profile covering where they hang out. Do that by asking your best employees what industry, professional, and social events they attend, what magazines and journals they read, and what social media and Internet sites they frequent. Assume that other top professionals hang out in the same places, so use the gathered information to identify the places where corporate branding, company information, and job announcements are the most likely to be seen and read. You should also be recruiting those who speak a second language (often Spanish); find the places where they will see and read your postings that are written in their language. Re-energize your employee referral program. Referrals are the best-performing tool for both recruiting volume and new-hire quality, and as a result they should be a major part of your recruiting toolkit. In order to maintain their effectiveness, employee referral programs need to respond quickly to employee submissions, and they must have their marketing periodically re-energized. Employees should be encouraged to search their social media, email, and mobile phone connections to identify potential referrals. Ask them specifically to refer their mentor, friends or former colleagues. Physical sandwich board announcements strategically placed in your lobby or in other highly traveled areas can be effective for filling immediate needs. Significant referral rewards can get everyone’s attention, and managers should be rewarded for high referral rates among their team. Targeted proactive referrals. Because great people are connected, the most effective referral variation is proactively approaching your top performers and asking them to identify the top five people who they know in their field. Occasionally individuals draw a blank when asked the question do you know anyone In these cases, the best approach is to structure your request. Ask your better employees to list the five colleagues who have impressed them the most during their careers in these specific categories (the best performer you ever worked with, the most innovative, the best team player, the best manager, the best under pressure, the best with technology etc. ). Then ask your employee to call these five individuals and try to convince them that it would be great to work with you again. If these individuals decline, try to turn them into permanent referral sources. Non-employee referrals. Individuals who know and care about your firm (i.e. former employees, vendor employees, retirees, and even customers) should be approached periodically for referrals. In many cases, rewards are not required. Mentor referrals. Mentoring relationships can be very strong, so take advantage of that by asking your employees if they have a mentor at other firms. Ask your employees to refer them and/or to use their mentors as permanent referral sources. Professional association officer referral. Ask association officers in your functional area or industry to be referral sources and to help you identify any up-and-coming professionals. Assigned referrals based on social network relationships. At larger firms, when a top candidate has already been identified, company recruiters can use network connections identification software in order to find out which of your employees have the strongest social media relationship with that target. The most strongly connected employee is then given the assignment (along with some coaching) to use their connections to contact and to build a recruiting relationship with the target. Recruiting at professional events. Because the best are sent to events, after referrals, professional events are the best source of quality hires. Ask your employees to recruit at local and national events, trade shows, awards dinners, and seminars that they are planning to attend. Develop the expectation that each employee attending these events will bring back three names of individuals who would be outstanding recruits. Also encourage your executives and superstars to speak at these events, because that exposure might result in some immediate candidates, as well as improvement of your overall employment brand. Certification courses. For jobs that require professional certifications, ask attendees from your organization to look for top talent during certification courses. Also consider having your top people teach the courses and maybe even hold them on your own site. Hold technical seminars. Top talent is always seeking out advanced learning opportunities, they are quite likely to attend a high-quality technical seminar that involves a well-known expert. Sponsor a technical seminar on a leading-edge topic and then recruit the top attendees. Where possible, hold it on your site and offer attendees a tour and provide a mechanism for them to mingle with your current staff. This is an effective tool when your firm’s name is not that great but your people and facilities are! Invitation-only evening open houses that highlight your new approaches and technology can also be effective. Recruiting at clubs and organizations. Ask your top employees to identify any social and professional clubs and organizations that they join. Then send speakers or recruiters to the events and encourage your employees to look for referrals among the members. Recruiting at social events. Employees in many industries work hard and play hard, so ask your top people which local social, entertainment and sporting events would be appropriate to recruit at. Also send recruiters to restaurants and after-work bars that are located close to your competitor’s facilities. Interns as on-campus reps. A full-time campus presence is an effective recruiting tool, so ask your college interns/part time staff to serve as recruiting representatives when they return to campus. Ask them to visit campus events, to offer stories during classes and events, and to provide you with the names of the best and what it takes to convince them. College referrals. A college students are extremely well connected on social media, so referral programs that ask current and past students and all interns to recommend other top students can be highly effective. Use last years hires for sources/recruiters. Ask last years college hires to help you identify and recruit this years crop. Because they are recent grads, they are highly credible. Grad assistants. The grad assistants of top professors not only know the best students but they are very good at convincing them to accept your new opportunities. Reward them for making successful referrals. Officers of professional student organizations are also excellent talent scouts. Two years out college hires. If you have not had a lot of success competing for students graduating right out of school, instead try re-contacting those you wanted two years out of school. You might find recruiting them now is a lot easier as their preferences change after they have worked at a firm. Part two of this article will cover advanced recruiting approaches and candidate closing tools for increasing your offer acceptance rates.